Hft's annual Christmas concert returned to Bradford this December, with people we support taking on starring roles in the festive evening. Talented adults with learning disabilities took to the stage at Hft’s annual Christmas concert, which raised nearly £900 for a new creative hub in Bradford. The beautiful Bradford Cathedral was brought to life on 4 December by two music acts from Hft’s Bradford service, including a samba band who opened the evening with a drum march, and The Raucous New Yorkshires, a cover band who play regularly around the city and received brilliant feedback from the audience. The Bradford Cathedral Consort Choir also performed at the candlelit event. 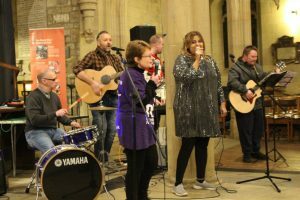 Mince pies and mulled wine rounded off the multi-faith festive spectacular for the whole community, which saw over 150 people come together to raise money for adults with learning disabilities. All proceeds from the festive evening are going towards funding the creation of a new music hub for Hft’s Bradford’s Learning Zone, a creative and vocational learning centre offering a range of classes and activities including textiles, drama and sports to almost 90 people a day. The new music hub is a self-contained converted garage which is set to provide a space for exploring and practising all things musical. “A fantastic time was had by all at our wonderful annual festive evening. People supported by Hft shone like stars when they performed in front of their community, and guests enjoyed the lovely range of performances and readings. It was also great to have Lord Mayor Councillor Zafar Ali attending. Hft currently supports more than 2,500 people with learning disabilities across the country. This includes supporting people with learning disabilities to live independently in their own homes, providing employment services to help people develop skills and experience for work and helping people to pursue hobbies, make new friends and get involved in their local communities. For further information please call our media enquiries line on 0117 906 1697. Hft is a national charity supporting more than 2,900 adults with learning disabilities across England and Wales to live the best life possible. Established in 1962, the charity uses its own unique Fusion Model to consistently deliver high quality, person-centred support across all its services. Services range from supported living to residential care – from a few hours a week to 24 hours a day. Hft also helps people with learning disabilities to take part in daily activities, make friends and develop relationships and to find work.